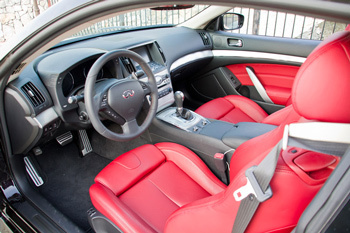 The 2011 Infiniti IPL G Coupe, priced around $50,000, for all practical purposes begins as a G37 Coupe Sport. Here is a quick rundown of the bigger changes from the Sport model to an IPL. The IPL is a wonderful mixture of personalities. Once you get past the disappointment of the IPL not being nearly as fast as a BMW M3, you’ll begin to enjoy it. The IPL engine tune is very responsive at virtually any rpm. From 2500rpm, it pulls strong and consistently on up to redline. The only downfall is the transmission. At this price point, being Infiniti’s halo performance car, the 7-speed just doesn’t match the feel of the suspension tuning. The average Infiniti buyer may not notice the shift lag, but then the average buyer will stick with a normal G37 instead of an IPL. To stay true to the P in IPL, Infiniti really needs to step it up to a dual-clutch or similar automated manual gearbox. However, to give Infiniti some credit, the paddle shifters themselves are perfectly positioned, sized, and weighted. Additionally, the transmission does nothing until you tell it to, which is a very good thing. The suspension may have been my favorite aspect of the IPL. While some may find it a bit on the harsh side, it’s not excessively so. For daily driving mixed in with some spirited jaunts, as well as the occasional high-speed performance driving event, I think Infiniti found a good balance. However, many will prefer a bit of a lower stance. The wheel/fender gap seems a bit much. While many would argue a lower stance reduces daily drivability with the lower ground clearance, I believe my point about the gearbox holds true. This is a car for enthusiasts, not your average Prius owner. The IPL comes in your choice of only two exterior colors, and even more limitations on interior color. Infiniti seems sure that IPL buyers will love a Graphite leather interior, as it’s your only choice unless you buy the 7-spd automatic IPL with a Malbec Black exterior. If you do opt for the 7-spd and Malbec Black, then your only interior option is Monaco Red leather. This was the combination of my test car provided by Infiniti. The red is darker than it seems in photos and quite appealing. If you want to row your own gears or prefer the Graphite paint, you better like a gray interior. The interior is stellar, as Infiniti has come a long way in the past few years. Fit and finish is superb, and you’ll be hard pressed to find something inside the IPL that doesn’t exude luxury. I did find it odd, however, to not see any IPL branding inside. In fact, the only mention of IPL anywhere is outside on the trunk lid and under the hood. The Bose audio system is good, but not great. This seems to be a common theme for quite a few years now in Nissan and Infiniti vehicles. The seats seem infinitely adjustable (10-way), making it quite easy to find a comfortable driving position. Interestingly enough, the easily accessible seat memory buttons on the door don’t do a thing unless the car is on. So don’t go expecting to use a preset before getting inside. Luckily Infiniti does allow the option of linking a memory preset to a specific key fob. I’d recommend doing so. The Bluetooth speaker phone works well at highway speeds. The system even downloads your phonebook. Just don’t expect to access your phonebook or enter a GPS destination while driving. You can thank the lawsuit-fearing safety engineers for that. Also in typical Infiniti fashion, don’t expect to put metal-rimmed sunglasses in the holder without hearing them rattle. A little extra felt in there (and in my 2005 G35), would be much appreciated Infiniti. The exterior styling of the IPL G Coupe seems to be up for a bit of debate. Overall, most agree the G37 Sport Coupe is an attractive car. As with most brand-topping performance coupes, the IPL has a little something extra on the exterior which also is functional for providing extra downforce. The issue for some seems to lie with whether that little something extra actually blends in with the car. While a few I spoke with thought the IPL bumpers, side skirts, and massive tail pipes looked great, most feedback I received was that depending on the vantage point, it looked like a poor choice in aftermarket parts. Whether you like them or not, it all is functional from an aerodynamic standpoint. The IPL was quite stable at high speeds. So is Infiniti wasting its time with the IPL? While it may not have the power of an M3, like many were expecting, the IPL starts at ten grand less with very few option boxes left to tick. To option out an M3 to similar spec, you’re pushing $70,000. Even if the IPL isn’t fully what many expected, it’s one heck of a good car leading Infiniti into the higher performance coupe realm. So my answer is no. 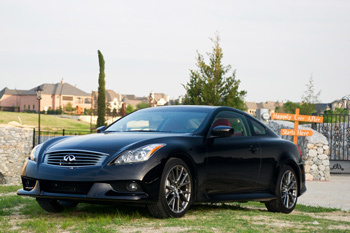 The 2011 Infiniti IPL G Coupe is just the beginning. You will see more of the IPL line, and Infiniti will continue to improve on it. I’m looking forward to it. Rush-hour commuter: With all the performance goodies on this IPL, Infiniti has done a great job preserving the luxury side. You’ll be coddled by the absolutely wonderful interior. Plug in your iPhone to the USB port and enjoy your own playlists, leave it in “D”, and aside from the obviously sport-tuned suspension, you’ll be coddled in luxury all the way to work. Find yourself in bumper-to-bumper traffic and are tired of using the brakes? Here’s your chance to use the paddle shifters. Click the left paddle to downshift and slow the car. As soon as you press the gas pedal and hold speed for a moment, the IPL will drop right back into “D”. Highway cruiser: While the IPL wouldn’t be your first choice for frequent cross-country trips, it is quiet and comfortable on the highway. There is plenty of passing power even without having to downshift, and if you do downshift, passing is effortless. 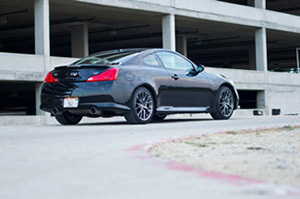 Grocery getter: The great thing about an IPL G coupe…it’s still a G37. You have all the functionality of the back seat and a moderately sized trunk. The IPL isn’t a large car, and it has great visibility from inside. And if you need a little extra help backing out of your Whole Foods spot, the standard rear-view camera will help you out. Family & friends hauler: Hauling around family and friends is something you want to do in the IPL. They will ask to be hauled around. As long as your rear seat passengers aren’t over 5’ 8” or so, you won’t hear too much screaming from back there. Kids will love it, and a lightweight forward-facing child safety seat is pretty easy to get in and install. One hand can flip the seatback forward and then slide the entire chair to its most forward position with the touch of a button. My only complaint is the seatback doesn’t remember its position when you put it back upright. Another press of the button on top of the seatback does, however, slide the seat back again. I wouldn’t even think about trying a rear-facing child seat, unless you have no plans for a front seat passenger. Occasional hoon-mobile: My guess is this category is why most owners will buy the IPL. It’s a good thing too, as Infiniti has made a car quite capable of hooning. The chassis is stiff and the suspension is well tuned for both smooth and rough surfaces. At higher speeds in a straight line, I did wish for a little more weight to the steering though. The steering ratio is quite responsive, and the car can become twitchy on bumpy roads unless engine rpms are above 5,000 or so, which weights up the steering a bit more. The body roll is minimal and only noticed upon initial turn-in. The massive 14.1 inch brake rotors have absolutely no issue in hauling down the IPL from any speed and give great feedback in the process as well. All in all, the IPL responds well and is rewarding to drive when pushed moderately. And if you push too hard, Infiniti’s Vehicle Dynamic Control (VDC) will smoothly bring you back in line. Track toy: I would be surprised if too many IPLs make it to the track regularly, at least not for a few years after being on the used market for a while. While it’s not the perfect track car, it should be quite capable. The IPL comes standard with a limited-slip rear differential. Couple the big brakes with the optional R-Spec High Friction brake pads, and you should have fade-free braking lap after lap with great pedal feel. As usual with almost all modern cars, there is some understeer if you come in too hot for a turn. Unfortunately it is not that easy to muscle through to oversteer. From my experience in the Z/G line, upping the width of the front tires to match the rear 245s will do wonders in reducing all that understeer. For the more serious track junkie without a dedicated track car, a few hundred bucks for some bigger sway bars will take care of the rest as well as rid you of the initial body roll. Take your pick on using the transmission’s Sport mode, which works amazingly well, or paddle clicking your way around the racetrack. Now you’ve got yourself a worthy track car which will get you home reliably, in style, and in luxury. Dragster: If you take an IPL to the dragstrip more than a couple times out of curiosity, you bought the wrong car. It’s a great looking car for sure! But if you’re saying this thing is $60k, I just don’t know if I think its worth that kind of money. I edited the article and put the price in there to clear things up a bit. The 7spd auto I had listed at $51k. 6spd manual starts at 58 I believe. The M3 starts around 60, but that’s a really basic car on the interior, with no options.